← Leading Valiantly – Is It Safe? If you were asked whether it’s important to feel and convey a measure of joy in your work, you would probably say yes. “Measure of joy” does not mean that we feel and express happiness in all aspects of our professional roles, but it does mean that we are more-or-less happy with our overall leadership choices and accomplishments. These statements seem obvious, but what’s intuitively obvious is not always within reach, as Selena’s story demonstrates. Ordinarily secure in herself and her skills, Selena has a track record of considerable accomplishment. She has been committed to her work as a nurse leader and passionate about making a difference for a long time. Perhaps at a different time in her life, Selena would not have been bothered by this situation. But she was having personal challenges at home, and despite a strong record of achievement, her organization’s recent cutbacks left her feeling vulnerable and insecure about her employment. • The organization’s changes and cutbacks were due to forces in the healthcare landscape that had nothing to do with her. It was true that she could lose her job. But she had taken that possibility personally, essentially blaming herself and her skills. She had given the job-loss scenario so much emotional weight that she devalued herself and her worth. As a result, she had become fearful and defeated rather than confident that she was capable, accomplished, and very able to make a difference—in any organization. • Her joy giveaway also applied to Fred. One of the reasons Fred’s reputation was so poor was that he was not a clear or direct communicator. He did not articulate his expectations, and he did not let people know whether they were succeeding. When they were not doing what he expected, he did not tell them what they could do to improve their performance. Selena interpreted Fred’s poor communication skills as her failure, and in doing so, she added to her own unhappiness and sense of inadequacy. 1. She took stock of herself. This was not arduous or time consuming for Selena. She simply reflected on her accomplishments, and she remembered the joy she had experienced so many times in her professional career—and in her life. She reacquainted herself with her motivations for doing the work she does, and how rewarding the work has been. By doing this, Selena essentially adjusted her boundaries—she did not let anyone else have the power to take away her sources of happiness and well-being. 2. She faced the uncomfortable truth that a job loss was possible. This continued to trouble her, but instead of feeling defeated by it, she decided to continue to do the good work she was capable of, knowing it would serve her in her current position or in a future organization. 3. She adjusted her thinking about how to approach Fred. She remembered the many skills and excellent qualifications she brought to his project. She also shifted her focus from his body language and gruff affect to determining what she needed to hear from him to complete the assignment successfully. She developed a list of direct questions to ask in their next meeting. 4. She also set an intention to not “make Fred wrong” for his probably deserved reputation. If he gave her negative feedback, she was going to evaluate his comments rather than simply take them in without examination. 5. She made some new commitments to herself. They included noticing when she was getting into a negative spiral of demoralizing thoughts and stopping it before it accelerated. She realized that the peers who were telling her about Fred’s reputation were attempting to help her, and she was going to clarify how they could best support her going forward. What led Selena to the soul-restoring solutions she needed? It was her willingness to pause long enough to re-evaluate her feelings, her thinking, and her experience. 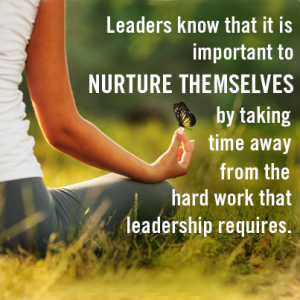 By taking her already acute self-awareness to a deeper level, she found new grounding in her joy and her accomplishments as a leader and committed healthcare professional. She focused on the part she plays in sustaining her well-being at work, and she took back her professional and personal power. 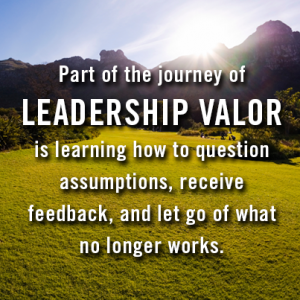 Catherine Robinson-Walker, MBA, MCC, is a master certified coach, speaker, and author of the new book Leading Valiantly in Healthcare: Four Steps to Sustainable Success. She can be reached via email at cathy@www.leadershipstudio.com. 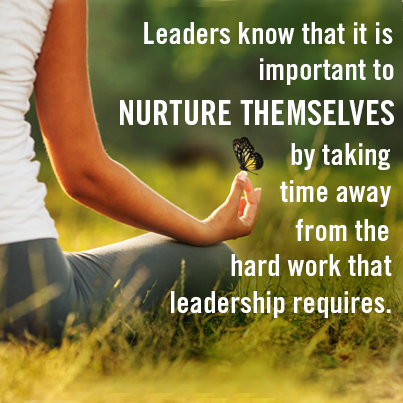 This entry was posted in Blog and tagged Healthcare, Leader, Leaders, Leadership, Management, Nurse, Nursing, Value. Bookmark the permalink.